Iona Jean King, age 85, of Coloma, passed away peacefully Monday, Jan. 14, 2019, at her home. She was born July 20, 1933 in Cashton, WI the daughter of Oral Ben and Ardell (McMullin) Olson. She married Daniel W. King on Oct. 20, 1951 at St. Paul’s Lutheran Church in Coloma. He preceded her in death on Jan. 29, 2012, after 60 years of marriage. Iona Jean was a graduate of Westfield High School. She was employed at the former M&I Peoples Bank in Coloma for many years until her retirement. 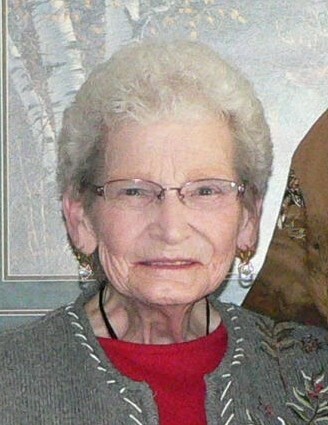 She was a faithful member of Calvary United Methodist Church in Coloma where she belonged to numerous parish committees, served as president of the United Methodist Women and taught Sunday School. Iona Jean will be fondly remembered for singing with the Eighth Notes Double Quartet of Coloma. She also belonged to the Yarn Club of Coloma. Iona Jean loved watching the Packers, Badgers and Milwaukee Brewers. She enjoyed working with her flowers and being surrounded by her family. She was also an avid reader and belonged to the Library Club. She is survived by her four children, Debra Kemnitz, Westfield; Paula (Terry) Loker, Oshkosh; Christy (Ronald) Hahn, Princeton; Larry (Gwen) King, Princeton; nine grandchildren, Amber (Scott) Laurent, Abby (Tyson) Swan, Aric (Pauline) Kemnitz, Alisa Kemnitz (Richard Kee), Adam Kemnitz, Ryan (Lisa) Curtis, Joe (Melissa) Curtis, Nicholas Hahn, Sarah (Darin) Drews; 14 great grandchildren, Emily, Bryanna, Brandon, Troy, Holly, Kypton, Elaina, Adeline, Jacob, Kristin, Wesley, Eli, Logan and Tenley; two sisters, Fern (Wally) King, Coloma, Susan Enns, Arizona. She is further survived by other relatives and friends. In addition to her husband, she was preceded in death by her parents; her great grandson, Ethan Drews; her son-in-law, Norman Kemnitz; and by one brother-in-law, Jerry Enns. Funeral services will be held on Friday, Jan. 18, 2019 at 12 Noon at Prince of Peace Lutheran Church in Coloma with Rev. Joan Frost officiating. Burial will be in Hillside Cemetery, Coloma. Visitation will be held on Friday at the church from 10:00 a.m. until the time of services.